I am so sorry to say this, but–I was disappointed by Mockingjay . 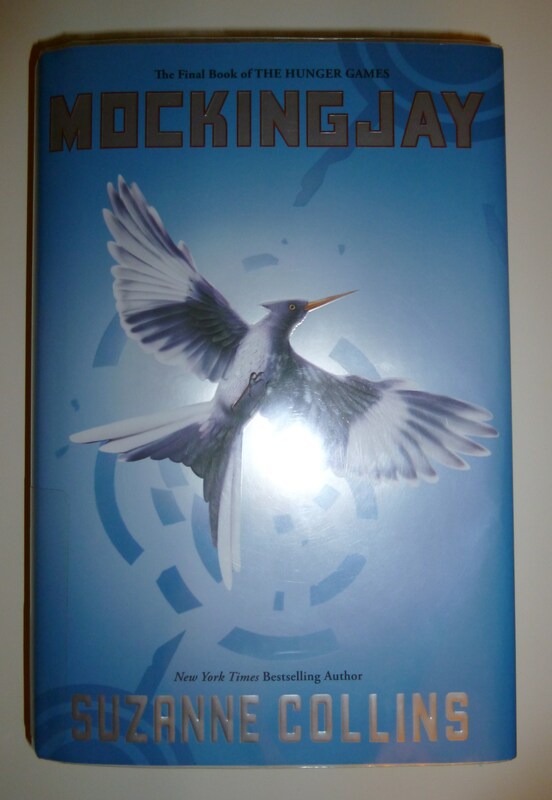 If you read my earlier reviews, you know that I thought The Hunger Games was brilliant. Catching Fire had flaws, but was promising. And Mockingjay never fulfilled on the promises. My Katniss problems of the second book magnified enormously in the third. She carries on with her inability to figure out what to do. I had hoped that this was a second book, bridge-segment issue, and that it was just setting up the third book’s resolution. But no. The rebellion is in full swing by this point, but Katniss still spends large portions of the book moping and moaning and debating what she should do. Even after she makes some decisions, she still spends way too much time hiding in closets (yes, literally), heavily medicated, or sunk deep in depression. Part of me wants to be understanding. She has, after all, been through Hell, and is in some ways still there. But so has everyone else. And a lot of people are handling it much better than Katniss. People are literally fighting and dying for their freedom, Katniss is in a unique position to help the cause–and she can’t seem to rise to it. That, I think, is the crux of the problem. I wanted the story of Katniss taking her pain and her horror, using it all to become a stronger person, and to grow into her role as the Mockingjay, the rebellion’s symbolic leader. Instead, I feel like I got the story of how Katniss (and Peeta, Gale, Haymitch, Finnick…everyone, really) has been severely damaged by all they’ve been through, and will never fully recover. It’s probably very realistic. But it’s not narratively satisfying. I find myself looking at stories from two angles. Is it realistic–can I believe that it could be real? Yes. But was it a good choice for the writer to make? I don’t think so. Maybe Katniss really would lose it completely. But I can’t imagine why a writer would choose to have her protagonist fall to pieces for the second half of a trilogy (starting midway through book two and going on until the end). Another problem is that we’re so removed from the rebellion in many ways. Katniss is a symbolic leader, but she’s not a strategic leader and she only occasionally engages with real fighting. Mostly, she’s used by the rebel leaders for PR purposes (which actually are some of the best parts, because at least she’s doing something). In a way it makes sense, but it also traps us in the point of view someone who is only peripherally engaged in this huge sweeping conflict. I really liked Gale. He does develop a ruthless streak that certainly wasn’t admirable, and he doesn’t always know the right thing to say to Katniss. He’s flawed. But he takes an active role in the rebellion, he engages with what’s going on and understands what they’re fighting for, and he’s still trying to protect the people he loves. There’s a scene where the community is threatened, and it’s actually Gale, not Katniss, who makes sure that Katniss’ sister is all right. He’s still thinking straight. Unfortunately, he’s not the protagonist. It’s still an exciting book, and I did find it absorbing–although one reason it was a page-turner was because I was trying to get to a more satisfying part of the book, and then I never did. I liked the grayness of good and evil, which we saw before and was even more evident now. The character development, so good in the others, was lacking. When new characters were introduced, they didn’t feel as vivid as similar minor characters in the first two books. As to the love triangle. Well. It was resolved, but it was resolved quickly, and ultimately I didn’t find it that satisfying. Maybe this just wasn’t the right setting for a romance. But the first book managed such a nice balance with that, I feel like there must have been a better way to do it. I realize that some of what I wanted from the book may be cliches. Maybe Collins was trying to tell something really different, that didn’t follow the normal conventions of a coming-of-age story, or of a traditional romance. But you know something? Some devices are used a lot because they work. I still think The Hunger Games is one of the best books I’ve read this year, and it was worth reading the other two just to find out what happened. I just wish I’d liked what happened! Nice review. I really do agree with this. The Hunger Games was an awesome book, and while Catching Fire did have its problems, I could overlook them because the pros of it outweighed the bad. But Mockingjay just seemed to take all that was wrong with Catching Fire and make it even worse to the point where it couldn’t be ignored anymore. I like Katniss in the first book. She was kind of a b***h when you get right down to it, but in a likable way (if that makes sense). Starting with Catching Fire though, she just started to get on my nerves: leading on two boys at once, whining about how what she’s going through is somehow harder than what everyone else who’d been through the exact same thing is going through . . . I just think that the books would’ve been way better if it had switched to the point of view of Peeta or Gale. I agree, Katniss was tough but likable in the first book–but somewhere in the second two she stopped being likable. I think you hit it when you said she was complaining about what was happening to her, while it was happening to everyone else too. I’m fine with a flawed protagonist, but I do want to feel that the protagonist is ultimately someone I can root for…but in the end Katniss ended up being far less sympathetic than many of the characters around her. A different point of view could have made a HUGE difference. I kinda’ really hate it when sequels don’t live up to their predecessors. I’m reading a series right now where I found the first book really intriguing, but the following ones have been lacking. The first book doesn’t work as a standalone? I know there are plenty of books that start out a series but don’t compel you to read subsequent books. I’ve learned that several of my favorite books have sequels—multiple sequels—but I don’t feel like I’m missing anything by not having read them. And maybe I will read them some day, but I’m not in any hurry to do so. The first book of the Hunger Games doesn’t feel stand-alone to me (although I did come to it knowing there were two others, which might skew my perception). The love triangle is left completely unresolved, and I think you can tell even at that point that there’s a revolution coming, but it’s barely begun in that first book. I know it left me eager to read more! Valid point for other series, though. One of my favorite books has three books that follow it; I read Book #2 (twice–I really wanted to like it!) and it was so bad I haven’t bothered with the rest. The first one is definitely stand-alone so it doesn’t matter. It seems like everyone wanted the ending to be very much a heroine/adventure ending, both because of the genre of the book and because that is how the first two books seem to set up the story, but then Collins chose to end it as if she was writing wartime literary fiction. It was an interesting…but not that satisfying…but maybe that was her point? I read an interesting interview with her where she talked about how important it was for her for young people to understand the nuances and ambiguities of war (I’m sure I’m paraphrasing her terribly, but I think that was her general point). Hmm, very interesting to think about it as a war message. In some ways that makes sense, and in others that’s still very muddled. I think Collins has set up a difficult situation. We’re clearly meant to root for the overthrow of the sadistic government, and there’s no Gandhi-type figure suggesting there’s a way to do that which doesn’t involve war. Trying to combine that scenario with a “war is Hell” message seems very complicated. I again feel like Gale is the more compelling character–believing in a just cause, getting too ruthless, and having that ruthlessness come back to destroy people you care about…that seems like a much more compelling story arc than Katniss’ self-destruction. Thanks for the insight, it definitely gives me more to think about relative to the story!